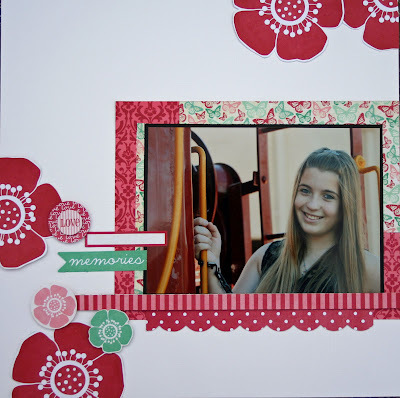 First, I thought I would share a layout with the Spring Fling collection from Teresa Collins! I absolutely adore this line! I still have to add a few blings, stickles and some perfect pearls, but I couldn't wait to share!!! Yes! Teresa Collins has been very very busy! She is the first designer to be released in the new Signature Series Idea Books. It is FULL of her fabulous designs and filled with some amazing inspiration! Make sure to check it out!!! These are new lines...first we have Everyday Moments. It is done is Navy Blue and yellow with some gray. It is gorgeous! I love that it is great for those daily moments that sometimes we forget to remember or tell about. Love love love this line. Now there are two Fabrications lines...one is called Canvas and one is called Linen. They are simply beautiful! They are perfect for any time, any event, any scrapbooking. They are filled with classic elegance. Totally Teresa! And last but not least Spring Fling. This line is so fun! It is the unexpected I think. I love the colors and the fun you can have with this line. And need I say how much I love the butterflies in it? Wink!! !